Extra heavy-duty super flexible all-weather thermoplastic elastomer cord, 50 ft. long. Superior resistance to oily, moisture, ozone, cracking and are standing for abuse, rough handling and wear. Outdoor use, the lighted connector allows to use where the power is on. Tough cord remains flexible up to 221Fahrenheit and down to -58Fahrenheit. Blue/orange cord. This HDX 3 in-line extension cords has 3 evenly-spaced outlets instead of just one at the end. The SJTW cords is rated 13 amp. Outlet covers help keep water and dust out. Ideal for landscaping, workshops, holiday lighting or any job-site requiring multiple tasks in different areas. This 16/2 wire size cord is CSA listed and has a plug and three-outlet polarized connector for convenient use. It has a safety cover or slide cover permanently attached to cover outlets that are not used. It's fully-molded plug and receptacle makes it ideal for small appliances at home and for connecting holiday lights. This is only approved for indoor use. This HDX 50ft 16/3 Yellow Extension Cord is specifically engineered for applications such as powering tools and portable lights. This extension cord comes with a 3-prong grounded plug and outlet for additional safety during application. It is made with durable vinyl jacket that resists abrasion, moisture and prolonged exposure to sunlight and are sturdy enough for both indoor and outdoor use. 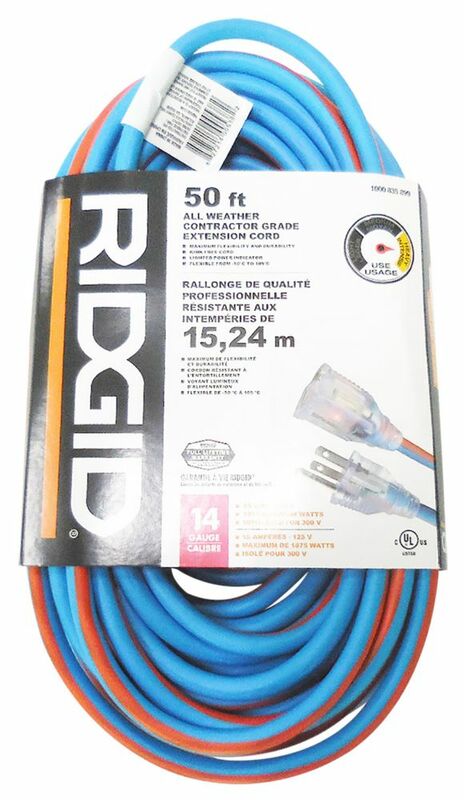 50 Feet All Weather Contractor Grade Extension Cord 14 Gauge Extra heavy-duty super flexible all-weather thermoplastic elastomer cord, 50 ft. long. Superior resistance to oily, moisture, ozone, cracking and are standing for abuse, rough handling and wear. Outdoor use, the lighted connector allows to use where the power is on. Tough cord remains flexible up to 221Fahrenheit and down to -58Fahrenheit. Blue/orange cord.